Orthotics aren’t just for adults or runners looking for the best positioning. It is highly common for children to over-pronate or suffer from fallen arches, which can leave them needing orthotic insoles. Over-pronation is a condition whereby a child’s anklebone rolls inwards causing them, more often than not, to develop an abnormal gait. Doctors and GPs can diagnose this quickly as it is usual evident straight away. Over pronation at a young age isn’t too much of an issue as the arches in the feet take 4 to 5 years to develop but, if the condition persists in to the teen years, it can cause further complications. Left alone, over-pronation can cause teens to suffer from Osgood Schlatters or Sever’s Disease. Osgood Schlatters occurs in pre and young teens when the over-pronation causes a drop inward of the kneecap that causes tension in the tendon which runs between to patella and the tibial tuberosity. Once aggravated it becomes painful and inflamed. Sever’s disease is similar in the sense that poor orthotics can cause the Achilles tendon to pull too much at the back of the heel, in turn causing inflammation of the calcaneal apophysis. This too causes the teen great discomfort and can hinder them participating in sport or even, in severe cases walking. both conditions. 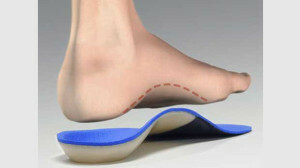 Orthotic insoles are designed by podiatrists to provide biomechanical support. The insoles can slip in to most shoes quite comfortably and help to realign the feet and alleviate joint pain. By using science to restructure the foot you can help to prevent subsequent conditions or injury later in life too. Be the first to comment on "Orthotic Insoles For Kids"